So by now, I hope that you have all figured out what colors and materials you are going to use for making Linda Richmond's Net Full of Gems necklace for our first Bead Along! I've decided to use some white Howlite chips and some gunmetal lined Delica beads, and my findings are some really gorgeous new Glinter silver beads from Elephant Eye Beads. The necklace is made with beaded netting. I was surprised at how many people emailed me to say that they had never tried beaded netting and that they were going to use this project to learn how to do netting! The Net Full of Gems necklace is a perfect first project for learning how to do beaded netting because the large gemstone chips are easy to see as your "pass through" beads. These are the beads that you will stitch through to create each unit of beaded netting. Counting out each round of gemstone chips will help you keep track of where you are in the netted tube. Our first step this week will be to start the netted centerpiece of the necklace that uses the gemstone chips. When picking up your first round of beads, it might help you to pick out the twelve gemstone chips you need for the initial set of beads. Set them aside so that you don't drive yourself crazy trying to count chips as you string them onto your needle and thread! In future rounds, it can also be helpful to count out and set aside six chips for each round. This way, if you have a hard time figuring out where to make the "step up" at the end of each round (just like in tubular even count peyote stitch), you'll know exactly where to go after you've added the last chip in the round. You can give the netted tube more shape by keeping your tension tight while you stitch the beaded netting, and by using a heavier weight of beading thread. Tension is also important for this project. Don't expect the netted tube to be perfectly stiff and hold its shape exactly. The finished netted necklace will have a slight drape to it, making it more comfortable to wear. As you are working the netting, keeping your tension tight will give this part of the necklace some body. 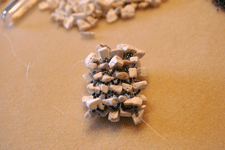 You can also use a heavier weight of beading thread to give more shape to the netted tube. I'd recommend using either a 6 lb. or 10 lb. test Fireline or Wildfire beading thread. 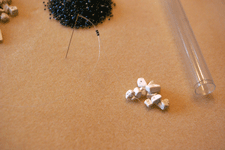 Nylon beading threads are okay to use for this project, but you should use a doubled thread to prevent the gemstone chips from wearing and possibly breaking the beading thread. I've set up a thread in the Forums where we can chat with each other about this project and share our pictures as we progress. If anyone has any questions, feel free to leave me a message in that thread or here on the blog!